Thanks to the gender-bending of Boy George and Marilyn, and the androgyny of Annie Lennox, we'd become used to seeing pop stars exploring all types of gender identity in the mid-'80s. This week in 1984, that continued as one of the world's most enduringly popular bands - comprised of four men - frocked up in the video for their latest single. The music video, which parodied a long-running British soap opera, helped the song become another top 10 hit for the band around the world... except in North America. Seems a bit of tongue-in-cheek drag action was too much for those conservatives in the US. A song from a movie set in a typically conservative US town became the new number 1 song in Australia this week in 1984. "Footloose" by Kenny Loggins started a three-week run on top. Their immediate follow-up to "I Hear Motion", "No Shoulders, No Head" had missed the top 100 completely - and this latest single from The Pleasure Of Your Company didn't do much better. Unlike other breakdance-related releases - including another one taken from the Breakin' soundtrack we'll see in July - this one and only single for Hot Streak didn't quite make the grade. I guess it's to be expected that the song that launched freestyle - a genre that never took off here - wasn't a hit in Australia. Alongside Madonna's "Holiday", the US top 10 hit also helped establish the post-disco genre of dance-pop. Scotland's Big Country found themselves back in the top 50 with this brand new stand-alone song released between their first and second albums. In the UK, "Wonderland" became the band's biggest hit up until this point, reaching number 8. In Australia, it progressed no further than this debut position - which was probably better than it warranted. For the previous decade, Queen had been one of the most consistently successful bands in the world. 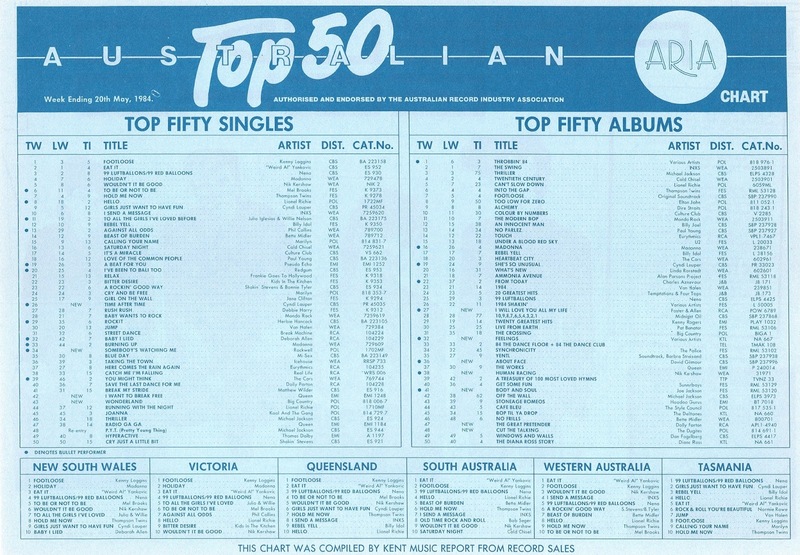 In Australia, they'd managed two number 1 singles ("Bohemian Rhapsody" and "Crazy Little Thing Called Love") as well as four further top 10 hits. Queen were coming off one of those hits, almost chart-topper "Radio Ga Ga", when they released the second single from The Works, "I Want To Break Free". Given singer Freddie Mercury's penchant for the flamboyant, the fact that he appeared in drag in the music video wasn't that out of character. But the idea for him - and indeed the whole band - to dress up as parodies of characters from iconic UK soap Coronation Street actually came from Roger Taylor's then-girlfriend. For a band known for earnest anthems like "We Are The Champions" and "Somebody To Love", the video for "I Want To Break Free" was a bit of fun - and most people got the joke. Most people, except the Americans. Deemed too controversial, the clip was banned by MTV and the single only reached number 45 on the Billboard Hot 100. Coincidence? 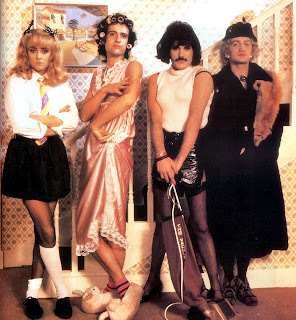 Besides the Coronation Street pastiche, the video also featured a second sequence in which Freddie performed with The Royal Ballet - a segment for which he shaved off his trademark moustache, despite having kept it for the drag scenes. Whether or not "I Want To Break Free" would've been as big in Australia with a less attention-grabbing video, we'll never know - it certainly was a strong enough song - but it duly became Queen's seventh top 10 hit. Their eighth wouldn't come for another five years. The Tori Spelling of the music world, Rockwell is the singer otherwise known as Kennedy Gordy, son of Motown Records founder Berry Gordy Jr (and half-brother of Redfoo, but don't hold that against him). Like the story of Tori auditioning for Beverly Hills, 90210 under an alias to dispel assumptions of nepotism, Rockwell's rise to fame wasn't due to him being given any preferential treatment by dear old Dad - in fact, Berry had no clue his son had even been signed to Motown at first. You can read the full story of "Somebody's Watching Me", which features Rockwell's childhood friend Michael Jackson on uncredited guest vocals and half-brother-in-law Jermaine Jackson on backing vocals, here. Released without publicising his A-list connections (although the Jacko vocal was kind of apparent), the song reached number 2 in the US and peaked just outside the top 10 here. Despite such a solid start, follow-ups like US top 40 single "Obscene Phone Caller" were less successful and Rockwell's career petered out after three albums. I wonder what would've happened if Cyndi Lauper's record company had got their way and released "Time After Time" as the lead single from She's So Unusual. We certainly would've received a very different first impression of the flame-haired singer, that's for sure. In the end, "Girls Just Want To Have Fun" became Cyndi's debut and she quickly showed her range by going from kooky to serious with emotional ballad "Time After Time". The last track written for the album at the behest of producer Rick Cherotff, who wanted "one more song", "Time After Time" was turned around incredibly quickly by Cyndi and co-writer Rob Hyman (of The Hooters). It was then chosen as her second single and, accompanied by a music video once again featuring wrestler Lou Albano and her ever-sweeping real-life mother, it became another top 10 hit in Australia and Cyndi's first US chart-topper. Next week: new singles by two British acts with shared musical history. The first is a singer who was fired by his band-mates and was now making his solo debut. The other is a hugely successful group storming back towards the top 5. The link? The keyboardist for the second act co-produced the big hit by the first act's former band. "Music makes you lose control" from 'Body Work' was sampled for the breakdown section in Dimples D's 'Sucker DJ', I noticed after listening to this. I became acquainted with Shannon via 'Give Me Tonight', which is a classic, early this decade after its appearance on a VHS compilation I bought. I like 'Let the Music Play', but it's not quite as good. I *love* the organ opening to ‘I Want To Break Free’, and its re-use as the build-up before the instrumental middle section. I also like how the instrumental bit is longer than in a typical pop song, with several different parts to it. I recall seeing the 'Somebody's Watching Me' video on Countdown and being slightly creeped out by it, but liking the song. It seemed like Cyndi was going to be massive after the one-two punch of ‘Girls’ and ‘Time After Time’. Cyndi WAS massive, though (unless I've misread your intention, Nathan)...! 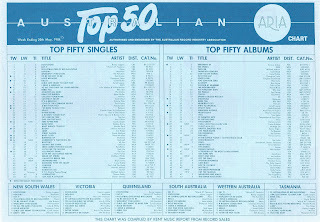 "She Bop" followed "Time After Time" into the Top 10, and both "All Through The Night" and "Money Changes Everything" were Top 20 hits in Australia. Then "Goonies" reached the Top 10, followed by "True Colors" in 1986. "Change of Heart" was another Top 20 hit (although "What's Goin' On" was her first misstep in 1987). 1988 saw "Hole In My Heart" become a Top 10 hit in Australia (and nowhere else) and then "I Drove All Night" was unlucky to spend several weeks at #11. She had around five years of being a force to be reckoned with until Australia completely lost interest (she's still a massive draw card live here, though). In actual fact, between early 1984 and mid 1989, only one of Cyndi's singles missed the Top 20 (she had 11 Top 20 hits, six of which reached the Top 10). Whitney Houston, in comparison, reached the Top 10 only four times in the first five years of her career, and scored only one additional Top 20 hit in the same time period. Of course, her albums were absolutely massive, but most artists with massive albums in the 80s were also capable of scoring multiple Top 10 hits from those albums (e.g. Michael Jackson, Madonna, U2, George Michael etc. etc.). Cyndi was extremely successful in Australia for five years. A footnote - Cyndi Lauper actually scored more Top 10 hits between 1984 and 1989 than Whitney did in her entire career (Whitney had just five Top 10 singles in Australia). In terms of Top 20 hits, she earned one more than Cyndi all up (12 between 1985 and 2000 versus 11 for Cyndi between 1984 and 1989). Cyndi WAS massive, as you say, but only really for a couple of years. After 1986, her only real hit locally was 'I Drove All Night'.